Here are some of the new orchids I am growing from seed that I am expecting will be available on this year's Plant List. These four species are at the protocorm stage or beyond. I am often asked for species I cannot yet provide. Be assured I am working hard to expand the range – the following notes explain why it is slow going. 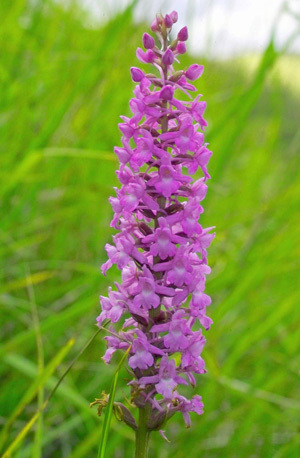 Growing hardy orchids from seed is a long and painstaking process, taking a minimum of two years before reaching flowering stage, and usually substantially longer. I have learnt it is best not to count “chickens before they have hatched" as developing plants can be lost at any stage, sometimes, heartbreakingly, en masse! But what exactly are the problems? This is by far the hardest part. A degree of dormancy has been conferred on fully mature seeds shed from the plant, and they simply will not start to grow without suitable stimuli and conditions. 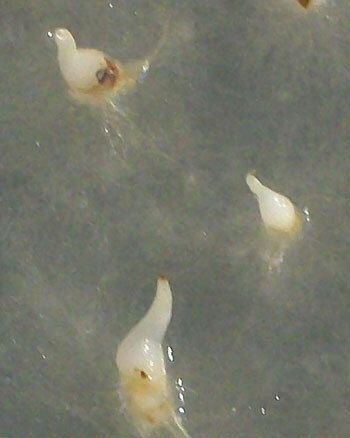 Various strategies are used to induce the tiny seeds to take the first step. These involve a nutrient medium with or without a symbiotic fungus, and also pre-treatment of the seeds. Sterile laboratory conditions are required as microbial contamination must be avoided. Different species need different approaches, and dormancy can sometimes be very hard to break. 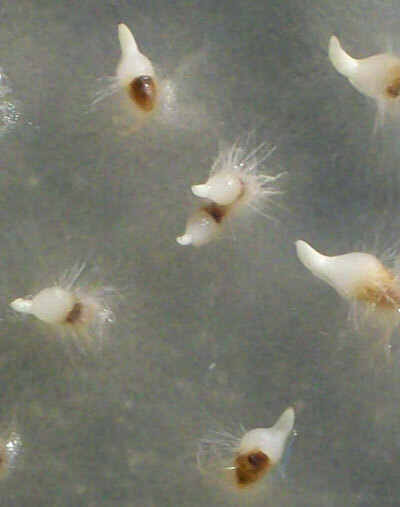 If germination is achieved seeds grow into delicate protocorms. These have to be carefully transferred at least once onto a fresh growing medium. 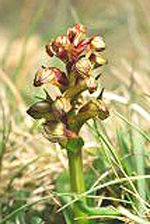 They will reach about 5 – 10 mm long with a small white shoot. For this phase sterile conditions are still necessary, but eventually air circulation must also be allowed. 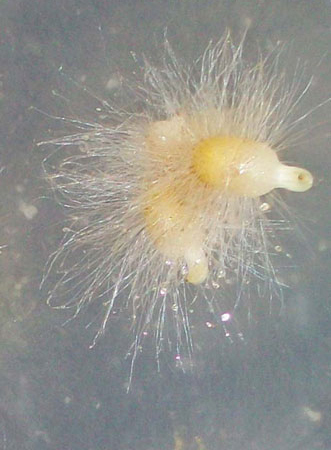 If a symbiotic fungus has been used for germination, its growth sometimes becomes too vigorous and it can overwhelm and kill the protocorms. When a small green-leaved plant has formed one can begin to believe the chances of ultimate success are high, but in reality we are not out of the woods yet! 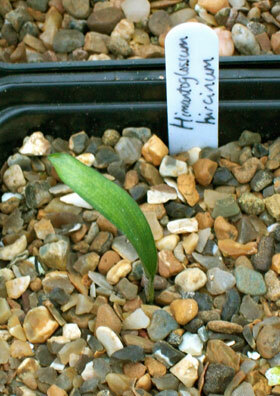 The small plant is becoming able to fend for itself and can be potted up. The transition to soil is a risky time, however, and having progressed so far they may now fail to thrive and slowly (or rapidly!) die. Seedlings raised without a symbiotic fungus seem to be harder to wean into soil than those with a resident fungus. 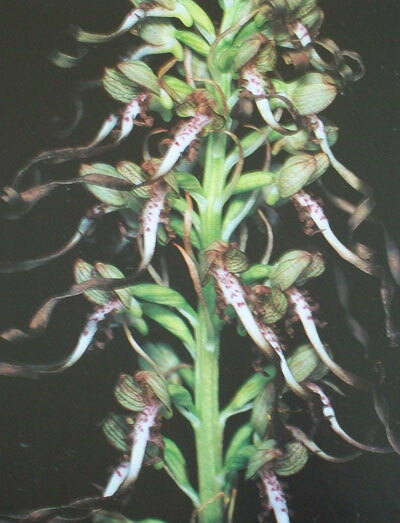 If the transfer to soil is successful they can, at last, be treated in a similar fashion to ordinary garden plants. Now the only danger is from all the usual things! – drought, greenfly, slugs etc etc It is all worthwhile, though, when you finally see the flowers.